By Blair Ranford - Shark Conservationist and Volunteer Shark Researcher with Dyer Island Conservation Trust, South Africa As we begin 2015 the controversy of the shark cull policy seemed a thing of the past. The Environmental Protection Agency ruled against extending the culling program for another three years. Reluctantly the Premier backed down admitting the policy had no future, and would respect the decision. Yet all was not as it seemed. As politicians do, talks were held behind closed doors on loosening the interpretation of the "imminent threat" policy. While they could no longer deploy 72 permanent drum lines, this vaguely worded policy was an opening for the Premier to continue to hunt sharks. 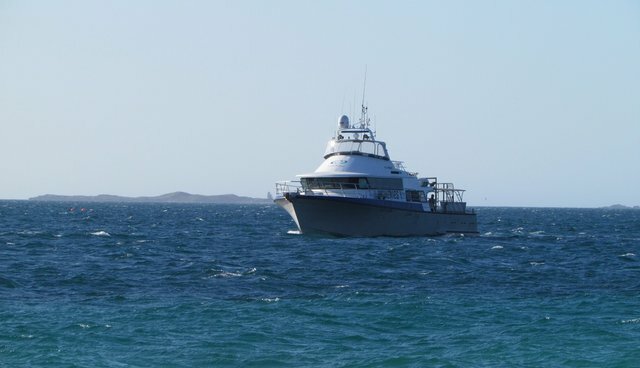 The "imminent threat" policy has been around since the tragic death of Ken Crew, off Cottesloe in 2000. It allows for sharks to be hunted immediately after an attack, or when an attack was deemed "imminent" and has been ordered a number of times in the years since. Due to the highly mobile nature of large predatory sharks like great whites, these deployments of baited drum lines met with very little success. Since 2000, only one occasion has led to the capture of a shark deemed likely to have been involved in an attack. That was the recent capture of two white sharks near Esperance, after an attack on a surfer. On the other occasions they have put bait in the water, no large sharks have been captured. The Western Australian government had been in talks with the Federal government, and an understanding reached to allow WA to kill sharks under its own guidelines. This new agreement is still yet to be seen publicly, or any environmental guidelines it was set against identified. It would be easy to see this as a political stunt, in no small part due to the lack of transparency they have shown with anything relating to the culling of sharks. This white shark believed to be an approximate three meter (about nine feet) female tagged in South Australia, was first detected on the Warnbro receiver, about one kilometer (approximately 0.6 miles) offshore, in late November. The same shark was detected numerous times between then and when the kill order was issued. One of the first questions that we should ask is was there any environmental conditions apparent which may have led to increased shark activity in the area. The answer is a resounding "yes." Warnbro Sound and its bigger brother to the north Cockburn Sound are well known for large schools of spawning snapper - so well known that the period of Oct. 1 to Jan. 31 inclusive they are both closed to snapper fishing annually. As stated on the WA Fisheries website this is to protect "the site of the largest known aggregations of pink snapper in the West Coast bioregion." These mature spawning snapper average between 10 to 20 kilograms (22 to 44 pounds). Not surprisingly sharks of many species feed on these snapper, such as bronze whaler, school, hammerhead, tiger, great white and more. Some of these other shark species also form a part of a great white's diet. This aggregation of marine predators also includes seals, sea lions and dolphins. It is a natural, seasonal and well-known feeding event at which sharks should be expected, that by and large locals are very much aware of. As part of their mitigation measures, WA Fisheries issued an advisory on Wednesday, Dec. 10 headed: "Caution urged for Perth water users." They stated, "the frequency and duration of recent detections indicates it is HIGHLY likely the current environmental conditions are acting as an attractant to both tagged and untagged sharks." Further they added, "this follows a series of shark sightings reported over the last two days and reports of baitfish along the coast." At this point the combination of detections of a tagged shark, combined with public advisories represents a sensible and laudable response to an increase in shark presence. One of the key goals of tagging sharks is to indicate presence/absence in near shore areas. This in turn helps identify times of higher risk related to changing environmental conditions such as the presence of schooling fish. This shark had been detected numerous times over a long period, yet no beach closure was issued. The presence of sharks at a natural and seasonal feeding event was to be expected, and this tagged shark gave a great indicator that the snapper schools were currently in the area of the shark receiver. The presence of these schools was confirmed both by divers and the sounder readings from vessels. Combined with public advisories, people could make informed decisions on when and where to use the water. It's important to note the receiver in Warnbro is a stationery one. It is anchored to the sea floor, and will "hear" the acoustic ping of any tagged shark swimming within a 400 to 500 meter (approx. 1,300 to 1,640 feet) range. It's the only receiver in Warnbro Sound, and it's a satellite linked VR4G allowing near real time updates. These detections are posted on Surf Life Saving WA's Twitter feed, as well as the government Shark Smart website. Again at this point the system is working, without the need to kill sharks vital to the health of our oceans. Indeed government review notes from 2013, obtained by Sea Shepherd Australia and NoSharkCull Inc. from a joint FOI application stated "any killing of a tagged shark would be detrimental to other shark mitigation initiatives." The ability of tagged sharks to act as vital indicators of changing environmental conditions is further highlighted by two white sharks known as "WA018" and "WA020." These two sub adult female white sharks, less than three meters (nine feet), were both tagged off Perth in Oct. 2012. WA020 was detected by the Cockburn Sound receiver array for nine days in Oct. 2012, and again from Dec. 30 to Jan. 2 in 2013. What's important to note is its presence at the location and time of the known seasonal snapper spawning. This spawning event is so well known to WA Fisheries as an attractant to sharks, they have tagged multiple great whites in this location. WA020 and WA018 were detected simultaneously in the Ocean Reef area to the north of Perth during Oct. 24 to Oct. 30 of 2012. As stated on the government Shark Smart website, "upon investigation researchers identified an unusual density of baitfish, larger tuna, sea lions and seabirds likely to have attracted sharks to the area." Again clear evidence of the benefit of tagged sharks to act as indicators, enabling the public to be informed of any heightened risk. 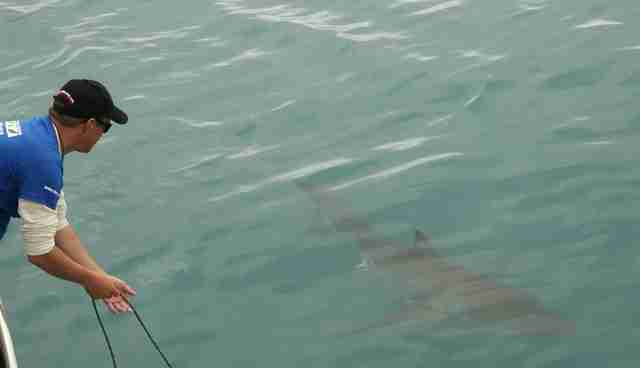 Back to the Warnbro shark: between Oct. 24 and Dec. 21 of 2014 it was detected a total of 253 times in the area. But up until Dec.19, no kill order had been issued or beach closures put in place. Yet on Dec. 19 a catch and kill order was issued, but what triggered it? Was it now being seen close to the beach? In close proximity to swimmers? Exhibiting aggressive behavior towards surfers? No, to all the above. 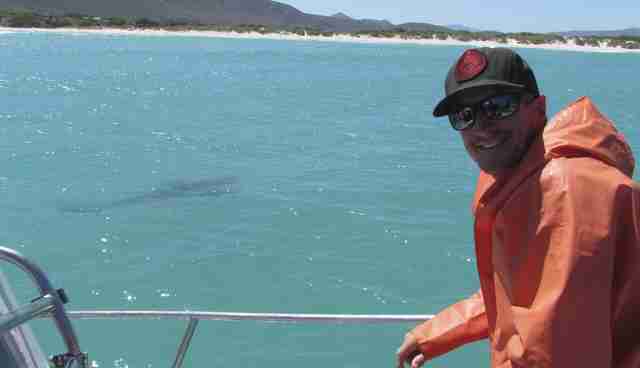 This shark had never been seen since it was first detected, not even by the regular SLSWA helicopter patrols. It had never come closer to shore than 800 meters (approx. 2,600 feet). And not one member of the public had reported being harassed by this shark or any other. So how did it now warrant a kill order? An increase in the number of day-time detections within 1km of shore on consecutive days during the lead up to Christmas, and school holidays combined with warm and sunny weather, people are more likely to be in the water using the beaches, fishing and diving. Read alone the statement seems simply foolish, dig deeper and the absurdity becomes even plainer. Given that the receiver is about 800 to 1000 meters (approx. 2,600 to 3,300 feet) from shore, and the shark had been detected over 200 times in the previous three weeks it clearly had been within one kilometer (0.6 miles) of shore for most of the month. It was detected on consecutive days from Nov. 24 to 25, Dec. 4 to 5, and every day from Dec. 9 to 19. I only refer to daylight detections, as this is what the now "serious threat" policy is gauged against. Dept. of Fisheries acting Director General Rick Fletcher stated that numerous other mitigation strategies to move the shark on had been tried and failed, but refused to name what these "other strategies" actually were. Scarborough beach to Perth's north is one of our busiest beaches. A tagged white shark was detected on its receiver on consecutive days in December. This triggered a beach closure yet no kill order. Warnbro sound experienced over 200 detections over a two month period, including 10 consecutive days in Dec. yet not once was the beach closed. The closure of Warnbro beaches came only as a result of a kill order being issued. It was stated that the coming school holidays was a contributing factor, along with warm and sunny weather. So is Premier Barnett stating that the lives of holiday makers are more important than those of the Warnbro locals? The same locals who had been using their beaches for the past month, despite the known presence of sharks? Beaches in the greater Perth area are always busy in summer, regardless of holidays. Why was Scarborough beach, a popular tourist spot closed for a tagged shark, and Warnbro (a residential area) not for a shark that indicated not only it's presence but likely many others due to schooling fish? The parallels to the Mayor of Amity Island from "Jaws" and the WA Premier seem more and more fitting. Beach closures and shark hunts to protect tourists and holiday makers, while locals look on in bewilderment and anger, all the while acknowledging and accepting the seasonal presence of sharks. So we now have a situation where a shark cannot come within one kilometer (0.6 miles) of shore, without the risk of being hunted down. Even worse if it should happen to be sunny, holidays, or that killer combination (for the shark) of all of the above. WA Fisheries are now ignoring their own research, and dismiss the relevance of sharks at known seasonal food sources when setting baited hooks along our beaches. But there is still one more massive flaw in their attempts to hunt and kill this shark that was exposed. In an article on Dec. 23 in WA Today, the Greens senator Lynn McLaren questioned the detection data which Fisheries stated showed an increase in the lead up to the kill order. This increase in the days prior was stated as the key reason for issuing the kill order, and so becomes the key issue if the data is in anyway dodgy. Data from the Shark Smart website for the VR4G receiver did NOT show an increase in detections in the days leading up to the kill order. The number of detections for the week starting Dec. 15 was 14 and 16 but in the days before the hunt began the detections had reduced to six, nine and nine. She said the detection patterns, "which include VR100 detections [mobile device] not on the shark smart website" showed an "increase in day time detections in the days prior to setting the capture gear on Dec. 19 compared to earlier in the month." If you are unfamiliar with what a VR100 is then this statement likely doesn't seem concerning. But bear with me as I explain. The detections on the Shark Smart website and posted to the SLSWA page are from stationary receivers like the VR4G in Warnbro sound. When a tagged shark swims within approx. 400 to 500 meters (1,300 to 1,640 feet), it pings in and the public is made aware of it. The number of detections in the days prior to the kill order had NOT increased, so where did the extra detections come from to warrant hunting a protected species? They came from a VR100 mobile tracking device. It appears they actively tracked down the shark away from the receiver, followed it, and then used those "forced" detections to justify killing it. It is unethical, deceitful and an entirely inappropriate use of the tracking capabilities of a tagged shark. Using a directional hydrophone with the VR100 means Fisheries can potentially follow a tagged shark for hours or even days, depending on environmental conditions and experience of the operator. On Dec. 19 only nine detections occurred from the VR4G, yet Fisheries claims detections were much higher. Are they stating these extra detections came from a VR100? How do they define detection numbers from this equipment exactly? If the weather is bad, or you have a bad operator it can be easy to lose the shark. So thanks to operator error did they simply lose and then re-find the shark multiple times, each time counting as another detection? Has a kill order being issued because someone is bad at their job? I have been fortunate enough to work with white sharks for a number of years in South Africa (although I am not a scientist), and that includes tagging and tracking white sharks using VR100 receivers. I know how they work, and how to use them. I'm appalled to see the science, the tagging and tracking, and the knowledge we gain from it go out the window. To see it turned around to help a government go on killing sharks, against the wishes of the majority, and the environmental watchdog that thought they had put a stop to it. In turn, the Premier has usurped the WA Fisheries Department, whose motto is "Fish for the Future," into doing his dirty work. I would love to know the feelings of the Fisheries' scientists, and other Australian researchers interstate, involved in tagging programs that are seeing years of hard work and dedication being thrown out the window - the sheer idiocy of the policy, the fact that it is not providing any safety to beach users but rather reducing it. It would be great if WA Fisheries would be open and engage in dialogue with groups like NoSharkCull Inc. and Sea Shepherd Australia and for that matter, the public. But as a dept they appear to have been gagged by Barnett, not willing to expose any more flaws in a fatally flawed policy. The government's only policy has been to stick their head in the sand, doggedly pursuing the killing of sharks in the mistaken belief it makes good policy. The Premier pushes his policy with no proven track record it works, yet will ignore requests for a shark spotter trial similar to the one used in South Africa. This program has spotted over 1700 white sharks in 10 years and runs in conjunction with a dedicated research program. I've seen the Shark Spotters in action and know first hand how effective they are. I have twice been called out of the surf thanks to them spotting white sharks. Last year I spent time with their team to learn more, and believe that a trial here is worthwhile. He refuses to fund the locally made Eco Shark barrier, which was successfully trialled last summer and provides swimmer safety without killing marine life. It was so successful and popular that Cottosloe council has begun researching its possible use at one of Perth's most popular beaches. Again despite the Premier refusing to fund any part of it. Money wasted on shark hunts, could be far better spent on proven real world solutions like these. This government's shark policy, the ludicrous "serious threat" policy (formerly known as the "imminent threat" policy) is a danger to people, by removing tagged sharks which are crucial indicators of risk factors. It is a danger to totally protected sharks like the white shark, and in fact any shark or animal capable of swallowing a baited hook. And the newest low of this policy is to drag good science down with it. To actively use tracking gear to "find" a tagged shark, to force detections and then use them to justify killing that shark. And all of this led by the man who is not only the Premier, but also the Minister for Science. Top Photo: Fisheries undertaking kill order at Warnbro Sound - 17 December 2014.